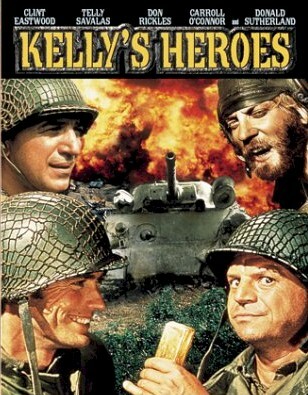 Kelly's Heroes. Metro Goldwyn Meyer 1970. I was a little skeptical on this recommendation when I first received it. I never expect much from films older than thirty years for some reason, but being self-aware of that fact, I eventually looked into it, and realized it’s not a war drama or straight action, but a comedy. And when comedy and explosions are mixed… well, it’s usually better than Sgt. Bilko (the Steve Martin film. Jury’s still out on how Phil Silvers did). I never would have expected to see Clint Eastwood and Don Rickles in the same movie, or really Don Rickles in any movie. I thought he was all standup other than voiceovers like Toy Story. Anyway, this looks like a war heist comedy… somehow. Sgt. Joe’s men are worn out after taking the occupied French town of Nancy, but Private Kelly manages to interrogate a captured German officer about the gold bars in his bag. Kelly learns that the gold comes from a shipment worth $16 million which is being held in a bank in a town thirty miles inside German territory. With three days of “down time” while their Captain is away, Kelly organizes basically his entire platoon on a rogue expedition behind enemy lines for purely capitalistic reasons. Eventually, a tank squadron, infantry division, and the campaign general get involved. This is the kind of subdued comedy I have trouble realizing it’s a comedy. It took me months to realize that Back To The Future was a comedy, not just a sci-fi with the occasional joke. Some very serious situations get played against some very funny characters, but Kelly himself is the same Clint Eastwood Clint Eastwood always is, and he dominates the first half of the movie. It didn’t settle down into an obvious comedy until the General got involved. Sure, Oddball is funny whenever he’s onscreen, but he has one or two early scenes and then drops out for half an hour, while the platoon gets all their jeeps bombed by a US plane and then gets caught in a minefield. The cast is huge, and I’m not sure if each one had a schtick, or just the ones memorable enough to notice as something more than a uniform carrying a gun. Crapgame is a desk sergeant who only joins up for the money, so of course he gets stuck lugging the biggest gun (which I would have liked to see him fire almost competently in the finale, but that wasn’t an obligatory storytelling move back then). They have a few farmboys, and some it seems weren’t as memorable as I thought, because I can’t remember them. Then of course there’s Oddball’s squad, or whatever that size of tank crew is called, who have set up as a fairly convincing look at as close as one may have come to hippy culture in the 40s. This is a rather sneaky comedy. I found myself laughing more than I realized throughout. It’s funnier than the tone it sets, which just seems odd in a world of discrete genres. It’s funny, and stuff blows up, but it’s not in your face about either of those things. Essentially, it’s a war movie made entirely out of the comic relief characters. Watch this movie: And laugh while stuff blows up. Fun. Don’t watch this movie: For commentary on war and military operations. I’m glad you enjoyed it, and I have to say that I think that your encapsulation of it as “a war movie made up entirely out of the comic relief characters” is very accurate. I’d never thought of it that way. And yes, the comedy is sneaky; there’s a lot of fridge humor.